Otherwise, I tell them I know because he isn’t wearing a necklace, and girls wear necklaces. 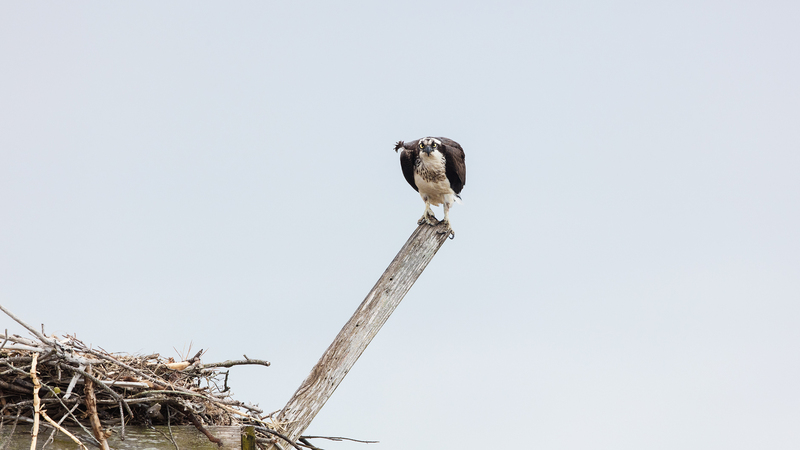 While it is not 100% accurate as an indicator in all situations, female Osprey usually sport a ring of brown feathers around their otherwise white breast. They do this because… you know… they look more pretty. Isn’t she a beauty? You better say “yes.” Not only is she wearing a necklace, but that’s Wendy. Posted in Wildlife and tagged jack & wendy, LBI, lbi osprey, Long Beach Island, osprey. Bookmark the permalink. Love more pretty, and males sometimes sport a partial necklace – guys just like to have fun! Yes, hence the disclaimer that it is not 100% useful. But with a pair on the nest, almost always! She is a big girl. Nice to see you on line again. Thanks. Good to be back! Thanks. I think she’s gorgeous–and scary! Thanks, Jim. Thanks Teresa. I’m glad you agree. Oh Wendy- welcome home from your South American winter hiatus! I’ve missed you. Jack & Wendy reclaimed their nest very, very quickly. This is an experienced pair! Oh! SHE…is beautiful, and classy, sassy, and a little bad-assy! hahaha. More than a little!